Ellis Island is a historical site that opened in 1892 as an immigration station, a purpose it served for more than 60 years until it closed in 1954. 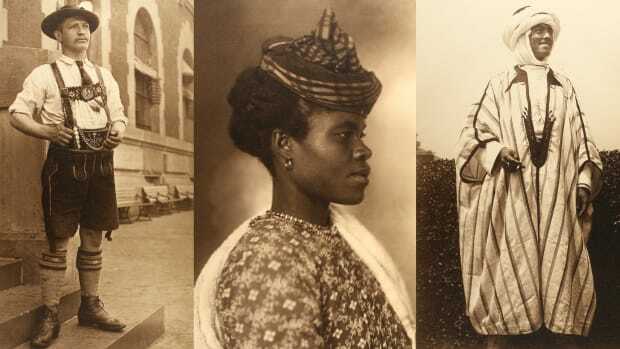 Located at the mouth of Hudson River between New York and New Jersey, Ellis Island saw millions of newly arrived immigrants pass through its doors–in fact, it has been estimated that close to 40 percent of all current U.S. citizens can trace at least one of their ancestors to Ellis Island. 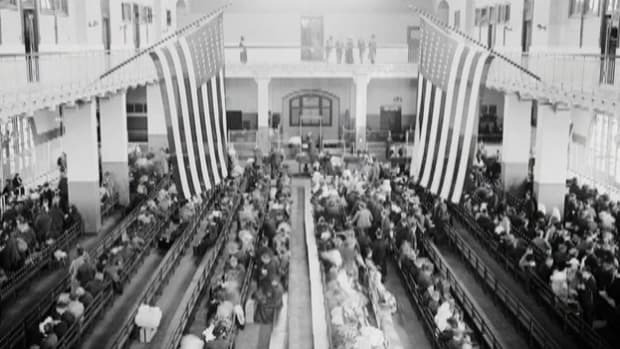 When Ellis Island opened, a great change was taking place in U.S. immigration. Fewer arrivals were coming from northern and western Europe – Germany, Ireland, Britain and the Scandinavian countries – as more and more immigrants poured in from southern and eastern Europe. Among this new generation were Jews escaping from political and economic oppression in czarist Russia and eastern Europe (some 484,000 arrived in 1910 alone) and Italians escaping poverty in their country. 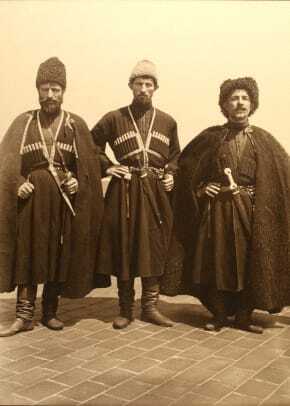 There were also Poles, Hungarians, Czechs, Serbs, Slovaks and Greeks, along with non-Europeans from Syria, Turkey and Armenia. The reasons they left their homes in the Old World included war, drought, famine and religious persecution, and all had hopes for greater opportunity in the New World. After an arduous sea voyage, immigrants arriving at Ellis Island were tagged with information from their ship’s registry; they then waited on long lines for medical and legal inspections to determine if they were fit for entry into the United States. From 1900 to 1914 – the peak years of Ellis Island’s operation – some 5,000 to 10,000 people passed through the immigration station every day. Approximately 80 percent successfully passed through in a matter of hours, but others could be detained for days or weeks. 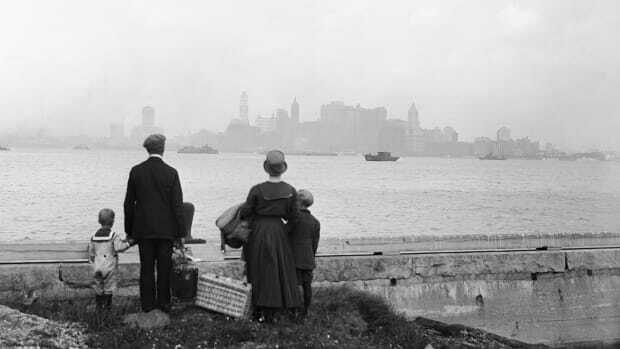 Many immigrants remained in New York, while others traveled by barge to railroad stations in Hoboken or Jersey City, New Jersey, on their way to destinations across the country. Passage of the Immigrant Quota Act of 1921 and the National Origins Act of 1924, which limited the number and nationality of immigrants allowed into the United States, effectively ended the era of mass immigration into New York. From 1925 to its closing in 1954, only 2.3 million immigrants passed through Ellis Island–which was still more than half of all those entering the United States. Ellis Island opened to the public in 1976. Today, visitors can tour the Ellis Island Museum of Immigration in the restored Main Arrivals Hall and trace their ancestors through millions of immigrant arrival records made available to the public in 2001. In this way, Ellis Island remains a central destination for millions of Americans seeking a glimpse into the history of their country, and in many cases, into their own family’s story. Ellis Island is little more than a spit of sand in the Hudson River, located just south of Manhattan. The Mohegan Indians who lived on the nearby shores call the island Kioshk, or Gull Island. In the 1630s, a Dutch man, Michael Paauw, acquires the island and renames it Oyster Island for the plentiful amounts of shellfish on its beaches. During the 1700s, it is known as Gibbet Island, for its gibbet, or gallows tree, used to hang men convicted of piracy. Around the time of the Revolutionary War, the New York merchant Samuel Ellis purchases the island, and builds a tavern on it that caters to local fisherman. Ellis dies in 1794, and in 1808 New York State buys the island from his family for $10,000. 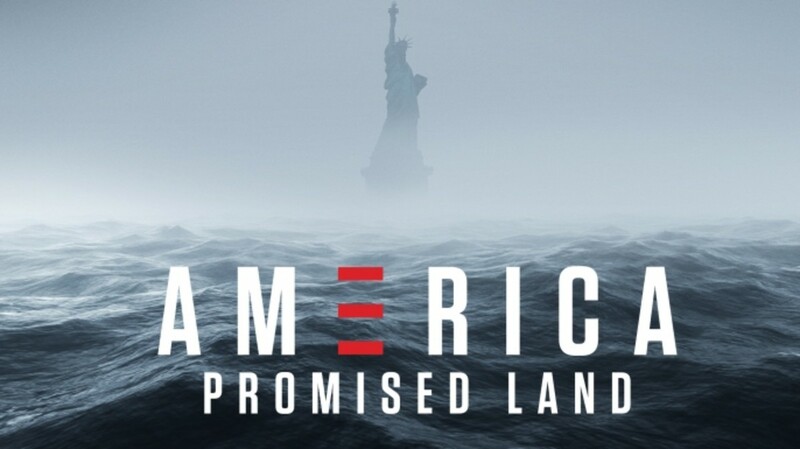 The U.S. War Department pays the state for the right to use Ellis Island to build military fortifications and store ammunition, beginning during the War of 1812. Half a decade later, Ellis Island is used as a munitions arsenal for the Union army during the Civil War. Meanwhile, the first federal immigration law, the Naturalization Act, is passed in 1790; it allows all white males living in the U.S. for two years to become citizens. There is little regulation of immigration when the first great wave begins in 1814. Nearly 5 million people will arrive from northern and western Europe over the next 45 years. Castle Garden, one of the first state-run immigration depots, opens at the Battery in lower Manhattan in 1855. The Potato Famine that strikes Ireland (1845-52) leads to the immigration of over 1 million Irish alone in the next decade. Concurrently, large numbers of Germans flee political and economic unrest. Rapid settlement of the West begins with the passing of the Homestead Act in 1862. Attracted by the opportunity to own land, more Europeans begin to immigrate. After the Civil War, Ellis Island stands vacant, until the government decides to replace the New York immigration station at Castle Garden, which closes in 1890. Control of immigration is turned over to the federal government, and $75,000 is appropriated for construction of the first federal immigration station on Ellis Island. Artesian wells are dug and the island’s size is doubled to over six acres, with landfill created from incoming ships’ ballast and the excavation of subway tunnels in New York. The first Ellis Island Immigration Station officially opens on January 1, 1892, as three large ships wait to land. Seven hundred immigrants passed through Ellis Island that day, and nearly 450,000 followed over the course of that first year. Over the next five decades, more than 12 million people will pass through the island on their way into the United States. On June 15, 1897, with 200 immigrants on the island, a fire breaks out in one of the towers in the main building and the roof collapses. Though no one is killed, all Ellis Island records dating back to 1840 and the Castle Garden era are destroyed. The immigration station is relocated to the barge office in Manhattan’s Battery Park. The new fireproof facility is officially opened in December, and 2,251 people pass through on opening day. To prevent a similar situation from occurring again, President Theodore Roosevelt appoints a new commissioner of immigration, William Williams, who cleans house on Ellis Island in 1902. To eliminate corruption and abuse, Williams awards contracts based on merit and announces contracts will be revoked if any dishonesty is suspected. He imposes penalties for any violation of this rule and posts “Kindness and Consideration” signs as reminders to workers. 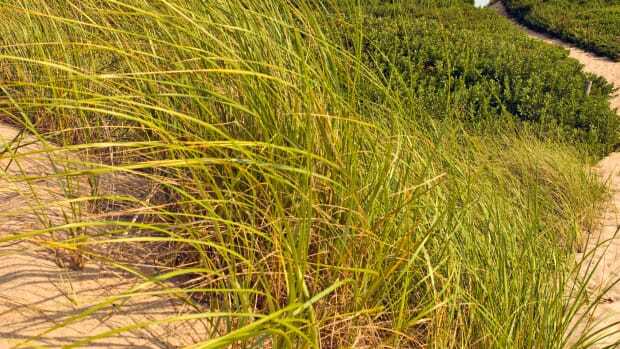 To create additional space at Ellis Island, two new islands are created using landfill. Island Two houses the hospital administration and contagious diseases ward, while Island Three holds the psychiatric ward. 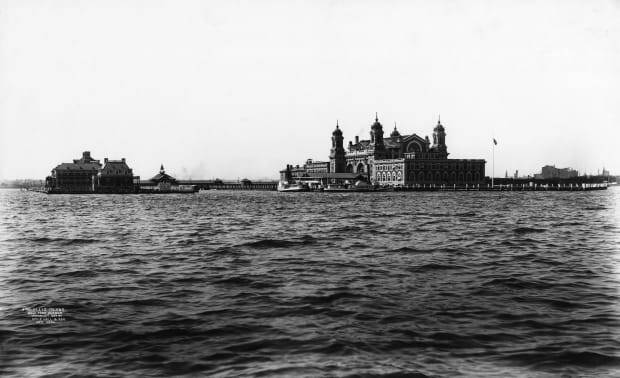 By 1906, Ellis Island has grown to more than 27 acres, from an original size of only three acres. Anarchists are denied admittance into the United States as of 1903. 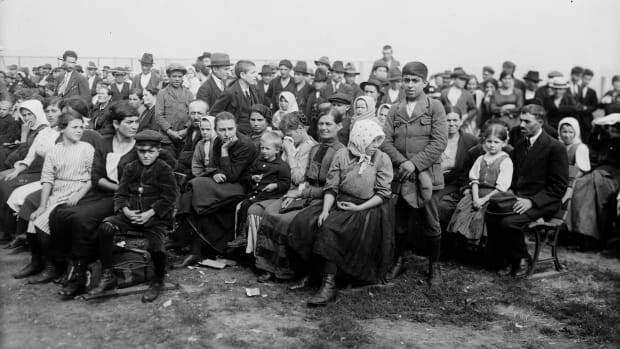 On April 17, 1907, an all-time daily high of 11,747 immigrants received is reached; that year, Ellis Island experiences its highest number of immigrants received in a single year, with 1,004,756 arrivals. A federal law is passed excluding persons with physical and mental disabilities, as well as children arriving without adults. World War I begins in 1914, and Ellis Island experiences a sharp decline in receiving immigrants: From 178,416 in 1915, the total drops to 28,867 in 1918. Anti-immigrant sentiment increases after the U.S. enters the war in 1917; approximately 1,800 German citizens are seized on ships in East Coast ports and interned at Ellis Island before being deported. Starting in 1917, Ellis Island operates as a hospital for the U.S. Army, a way station for Navy personnel and a detention center for enemy aliens. 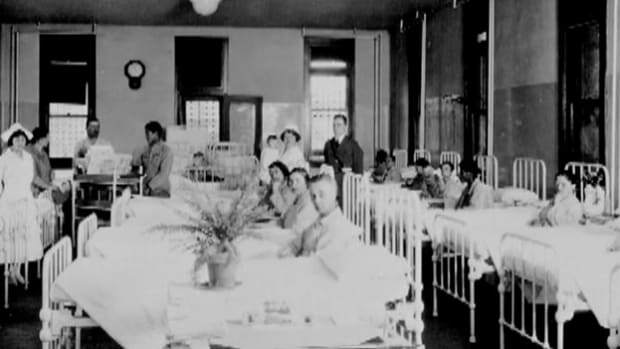 By 1918, the Army takes over most of Ellis Island and creates a makeshift way station to treat sick and wounded American servicemen. The literacy test is introduced at this time, and stays on the books until 1952. Those over the age of 16 who cannot read 30 to 40 test words in their native language are no longer admitted through Ellis Island. Nearly all Asian immigrants are banned. At war’s end, a “Red Scare” grips America, in reaction to the Russian Revolution. Ellis Island is used to intern immigrant radicals accused of subversive activity; many of them are deported. President Warren G. Harding signs the Emergency Quota Act into law in 1921. According to the new law, annual immigration from any country cannot exceed 3 percent of the total number of U.S. immigrants from that same country, as recorded in the U.S. Census of 1910. The Immigration Act of 1924 goes even further, limiting total annual immigration to 165,000 and fixing quotas of immigrants from specific countries. 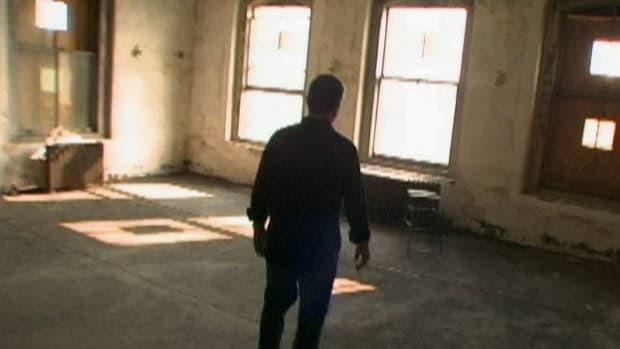 The buildings on Ellis Island begin to fall into neglect and abandonment. America is experiencing the end of mass immigration. By 1932, the Great Depression has taken hold in the U.S., and for the first time more immigrants leave the country than arrive. By 1949, the U.S. Coast Guard has taken over most of Ellis Island, using it for office and storage space. The passage of the Internal Security Act of 1950 excludes arriving immigrants with previous links to communist and fascist organizations. With this, Ellis Island experiences a brief resurgence in activity. 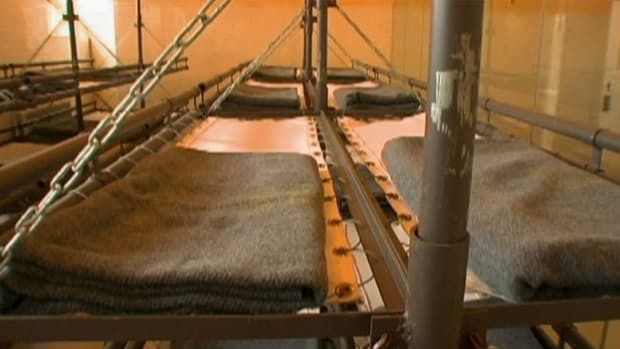 Renovations and repairs are made in an effort to accommodate detainees, who sometimes number 1,500 at a time. The Immigration and Naturalization Act of 1952 (also known as the McCarran–Walter Act), combined with a liberalized detention policy, causes the number of detainees on the island to plummet to fewer than 30 people. All 33 structures on Ellis Island are officially closed in November 1954. In March 1955, the federal government declares the island surplus property; it is subsequently placed under the jurisdiction of the General Services Administration. In 1965, President Lyndon B. Johnson issues Proclamation 3656, according to which Ellis Island falls under the jurisdiction of the National Park Service as part of the Statue of Liberty National Monument. Ellis Island opens to the public in 1976, featuring hour-long guided tours of the Main Arrivals Building. During this year, more than 50,000 people visit the island. Also in 1965, President Johnson signs a the Immigration and Naturalization Act of 1965, also known as the Hart-Celler Act, which abolishes the earlier quota system based on national origin and establishes the foundations for modern U.S. immigration law. The act allows more individuals from third-world countries to enter the U.S. (including Asians, who have in the past been barred from entry) and establishes a separate quota for refugees. In 1982, at the request of President Ronald Reagan, Lee Iacocca of the Chrysler Corporation heads the Statue of Liberty-Ellis Island Foundation to raise funds from private investors for the restoration and preservation of Ellis Island and the Statue of Liberty. By 1984, when the restoration begins, the annual number of visitors to Ellis Island has reached 70,000. The $156 million dollar restoration of Ellis Island’s Main Arrivals Building is completed and re-opened to the public in 1990, two years ahead of schedule. The Main Building houses the new Ellis Island Immigration Museum, in which many of the rooms have been restored to the way they appeared during the island’s peak years. Since 1990, some 30 million visitors have visited Ellis Island to trace the steps of their ancestors. Meanwhile, immigration into the United States continues, mostly by land routes through Canada and Mexico. Illegal immigration becomes a constant source of political debate throughout the 1980s and 1990s. More than 3 million aliens receive amnesty through the Immigration Reform Act in 1986, but an economic recession in the early 1990s is accompanied by a resurgence of anti-immigrant feeling. In 1998, the U.S. Supreme Court rules that New Jersey has authority over the south side of Ellis Island, or the section composed of the landfill added after 1834. New York retains authority over the island’s original 3.5 acres, which includes the bulk of the Main Arrivals Building. The policies put into effect by the Immigration Act of 1965 have greatly changed the face of the American population by the end of the 20th century. Whereas in the 1950s, more than half of all immigrants were Europeans and just 6 percent were Asians, by the 1990s only 16 percent are Europeans and 31 percent are Asians, and the percentages of Latino and African immigrants also jump significantly. Between 1965 and 2000, the highest number of immigrants (4.3 million) to the U.S. comes from Mexico; 1.4 million are from the Philippines. Korea, the Dominican Republic, India, Cuba and Vietnam are also leading sources of immigrants, each sending between 700,000 and 800,000 over this period. The American Family Immigration History Center (AFIHC) opens on Ellis Island in 2001. The center allows visitors to search through millions of immigrant arrival records for information on individual people who passed through Ellis Island on their way into the United States. The records include the original manifests, given to passengers onboard ships and showing names and other information, as well as information about the history and background of the ships that arrived in New York Harbor bearing hopeful immigrants to the New World. Debates continue over how America should confront the effects of soaring immigration rates throughout the 1990s. In the wake of the 9/11 terrorist attacks, the Homeland Security Act of 2002 creates the Department of Homeland Security (DHS), which takes over many immigration service and enforcement functions formerly performed by the Immigration and Naturalization Service (INS). In 2008, plans are announced for an expansion of the Ellis Island Immigration Museum called “The Peopling of America,” which opened to the public on May 20, 2015. 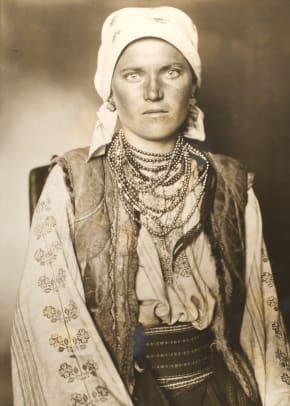 The museum’s exploration of the Ellis Island era (1892-1954) was expanded to include the entire American immigration experience up to the present day. On January 1, 1892 – her 15th birthday – Annie Moore from County Cork, Ireland, became the first person admitted to the new immigration station on Ellis Island. On that opening day, she received a greeting from officials and a $10.00 gold piece. 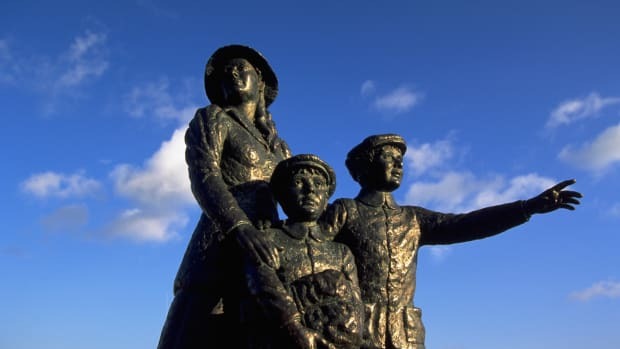 Annie traveled to New York with her two younger brothers on steerage aboard the S.S. Nevada, which left Queenstown (now Cobh), Ireland, on December 20, 1891 and arrived in New York on the evening of December 31. After being processed, the children were reunited with their parents, who were already living in New York. 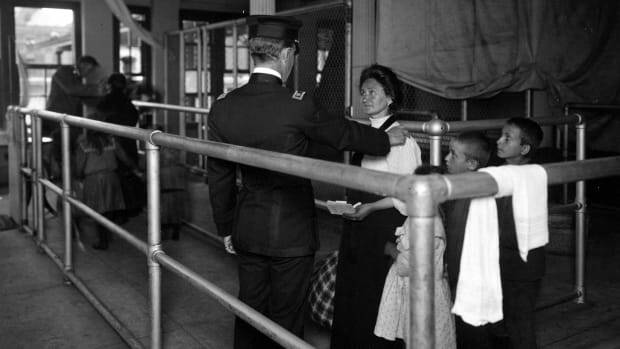 Doctors checked those passing through Ellis Island for more than 60 diseases and disabilities that might disqualify them from entry into the United States. Those suspected of being afflicted with a having a disease or disability were marked with chalk and detained for closer examination. All immigrants were checked closely for trachoma, a contagious eye condition that caused more detainments and deportations than any other ailment. 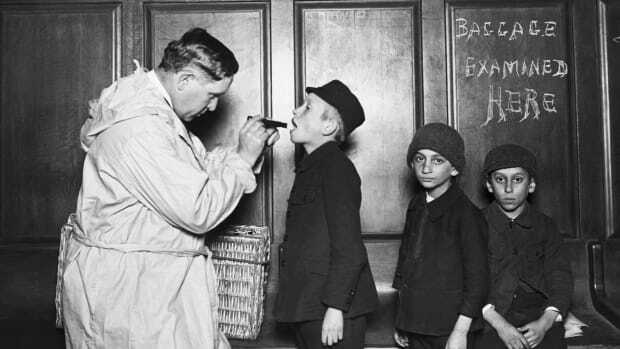 To check for trachoma, the examiner used a buttonhook to turn each immigrant’s eyelids inside out, a procedure remembered by many Ellis Island arrivals as particularly painful and terrifying. Food was plentiful at Ellis Island, despite various opinions as to its quality. A typical meal served in the dining hall might include beef stew, potatoes, bread and herring (a very cheap fish); or baked beans and stewed prunes. Immigrants were introduced to new foods, such as bananas, sandwiches and ice cream, as well as unfamiliar preparations. To meet the special dietary requirements of Jewish immigrants, a kosher kitchen was built in 1911. In addition to the free meals served, independent concessions sold packaged food that immigrants often bought to eat while they waited or take with them when they left the island. Many famous figures passed through Ellis Island, some leaving their original names behind on their entry into the U.S. Israel Beilin–better known as composer Irving Berlin–arrived in 1893; Angelo Siciliano, who arrived in 1903, later achieved fame as the bodybuilder Charles Atlas. Lily Chaucoin arrived from France to New York in 1911 and found Hollywood stardom as Claudette Colbert. 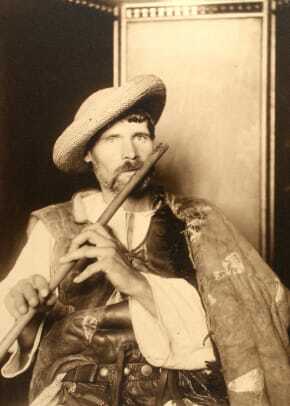 Some were already famous when they arrived, such as Carl Jung or Sigmund Freud (both 1909), while some, like Charles Chaplin (1912) would make their name in the New World. Fiorello La Guardia, the future mayor of New York City, worked as an interpreter for the Immigration Service at Ellis Island from 1907 to 1910, while he was completing law school at New York University. Born in New York in 1882 to immigrants of Italian and Jewish ancestry, La Guardia lived for a time in Hungary and worked at the American consulates in Budapest and other cities. From his experience at Ellis Island, La Guardia came to believe that many of the deportations for so-called mental illness were unjustified, often due to communication problems or to the ignorance of doctors doing the inspections.